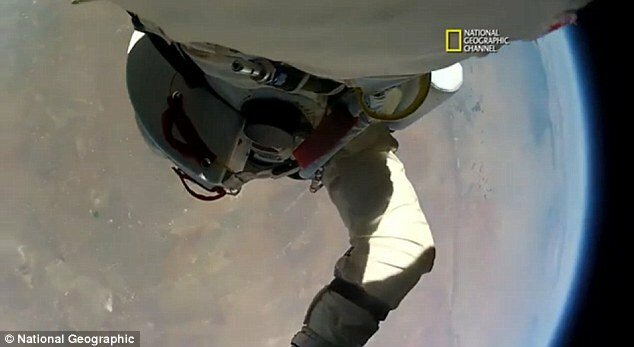 New footage taken from cameras attached to Austrian skydiver Felix Baumgartner’s body has been released to internet and shows the moment daredevil loses control. National Geographic and the BBC documented Felix Baumgartner’s 24 mile plunge to Earth using more than 20 cameras. The previously unseen footage is being crafted into a documentary about the 43-year-old stuntman, titled Space Dive, which is set to air on November 11. But National Geographic has given a taste of the spectacular 4-minute, 22-second free fall captured by two suit-mounted cameras, in the program’s promotional clip. The two-minute video captures the moment Felix Baumgartner steps off his space capsule and when he begins spinning dangerously out-of-control during the jump. In the breathtaking footage, viewers can also see the curvature of the Earth as the skydiver spirals towards the ground. Finally, Felix Baumgartner releases his parachute and the camera catches the look of relief on his face as he hovers to safety. The full-length documentary will also include behind-the-scenes footage exploring Felix Baumgartner’s four-year metamorphosis from an elite BASE jumper to an extreme altitude specialist. Despite his new status as a post-modern space trailblazer, the 43-year-old daredevil had publicly come out against NASA’s much praised Mars exploration project. “A lot of guys they are talking about landing on Mars,” Felix Baumgartner said in an interview with The Telegraph. “Because [they say] it is so important to land on Mars because we would learn a lot more about our planet here, our Earth, by going to Mars which actually makes no sense to me because we know a lot about Earth and we still treat our planet, which is very fragile, in a really bad way. Felix Baumgartner also offered some harsh for Sir Richard Branson, the founder and CEO of Virgin Galatic, who hinted that his company could attempt to break the Austrian’s record with a jump from 400,000 feet. “It sounds like kind of a joke because it looks like he wants to use our positive momentum and gain publicity on his side and that is kind of lame,” Felix Baumgartner said, adding that the idea of someone leaping from 400,000 feet was “completely insane”. Felix Baumgartner became the first human to break the speed of sound during the jump, reaching a total speed of 833.9 mph. He also set records for the highest balloon ascent, highest parachute jump and the fastest speed achieved by a human through the atmosphere. “Felix is an explorer in the truest sense of the word, and National Geographic Channel was honored to be a part of this mission,” said the station’s Michael Cascio. Felix Baumgartner’s gravity-defying leap into history, which was watched by seven million people around the world, has made him a household name, but the 43-year-old said he has not gotten used to his newfound fame. “It’s kind of scary, it’s kind of cool if you think about it,” he said.